My main target I to compare the effect on the malt. Thus I prepare three quite basic standard malts (Glenlivet, Glenfiddich, Glenmorangie), one more sherried malt (Bormore Darkest) and one very peated malt (Ardbeg), and just in case some one prefer single cask high strength, I also prepare the Dailuaine. With the three standard malts, I also take the chance to explain the MM scoring system again, and ask every body’s opinion for the “standard” malt as 75 points. Interesting, 9 out of 13 vote for the Glenlivet as more “standard” to him (she). To have more fun, I let everybody choose the malt he like to see the water effect. Most people use the same malt through the tasting. Only one person play a little bit with different malt. As most people don’t have too many glasses with him, we tried to taste three water ever round. For myself, I use Glenmorangie 10yo as I think it’s nosing is quite complex and easy to see the difference. 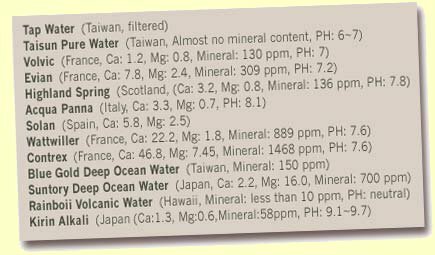 Taipei’s tap water is quite clean, but wit lot’s calcium(hard water) and easy to tell chlorine nose. … Everybody becoming quite exciting as everyone can easily tell the difference. Quite sweeter finish. Very balance and really “help” the malt performs better. 6 people vote for it. This one should be more close to pure water, won’t bring out better nose but seems very close to original note. 6 vote for this one. People believe you’ll easy get over hang-out if you had more alkaline water. I ask every one to taste it and prepare for the final vote. Without comparison, this one still performs well, but not too impressive. Highland Spring at the other hand seems brings out more layer, but won’t help the malt. The most interesting thing for the tasting, everyone in the tasting can tell the difference. Even there are several new-bie who has no experience on single tasting before. Most people agree a little bit hard water will help you identify more nose, but not necessary make it better. We can’t really identify which factor is most important for diluting water, It seems more Mg (magnesium) won’t help, a little bit Ca (calcium) should be OK. “Pure Water” (neutral water) seems quite OK as it won’t change anything.